This past summer, Kogod’s terrace lounge transformed into a museum celebrating faculty, alumni, and student achievements. 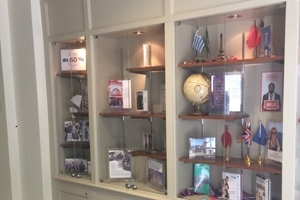 Located in the basement, at both entrances to the lounge, display cases filled to the brim line the walls proudly showing the many sides of Kogod. Students in need of a study break can visit the exhibits and learn about Kogod’s past and visions for its future. The five displays each highlight a different aspect of Kogod that makes the past 60 years unique. Keeping academics at the forefront, faculty lent their published work so students could learn more about their professors’ areas of interest. Books and film posters fill the case highlighting the research Kogod’s faculty contributes to their fields. Taking some credit for the past successful basketball seasons, a display case features the men and women who represented their school on the court while performing well academically. Championship rings can be found in the display thanks to a generous alumnus. On a global level, Kogod students never fail to leave a lasting impact on the places they visit. From the annual PMBA international experience to undergraduates studying abroad, opportunities are endless. Celebrating history, a copy of Dr. Wendell E. Clements diploma is displayed in the Black MBA case. Clements earned one of Kogod’s first doctorates awarded to an African American who went on to have one of the best dissertations in the country. Continuing to celebrate Kogod’s success, cases display the school’s 60th anniversary party. Students’ visions line the display case in diamonds outlining their well wishes for the school’s future. As we reflect on Kogod’s past 60 years and commemorate its success, we also look forward to the future and the next 60 years of the Kogod School of Business.